Coccidioidomycosis (aka "cocci", or Valley Fever) is a fungal infection caused by two species of Coccidioides fungi, infecting thousands of people in the southwestern US, and parts of Mexico and Central and South America. Recently, the fungi was detected in south-central Washington, both in clinical isolates as well as soil samples. Below, I summarize what we know about this disease and the pathogens causing it, the new area of detection, and the potential next steps forward in protecting the public from these bothersome fungi. Coccidioidomycosis (aka Valley Fever) is a fungal infection caused by fungi from the genus Coccidioides. These fungi are normally found in soil, and infects people who breathe in its spores. 60-66% of infections are subclinical in nature. Symptoms of infection are flu-like, including cough, fever, fatigue, shortness of breath, headache, night sweats, muscle ache and joint pain, and rash on upper body or legs. In most people, the infection resolves in a few weeks to a few months. However, approximately 5 to 10% of infected people, usually those who are immunocompromised, pregnant, have diabetes, or are of African-American or Filipino heritage, develop a severe infection that leads to serious and/or long-term problems in their lungs. In about 1% of infected people, the infection becomes disseminated, breaching the blood-brain barrier, or infecting the skin, the bone and the joints. The infection can be diagnosed through a commercially available antibody test for Coccidioides fungi, or through tissue biopsy and culture methods. Treatment involves taking a 3-6 month regimen of fluconazole or other prescription-only antifungal medication orally. For those patients that developed meningitis associated with the coccidioidomycosis infection, antifungal medication is lifelong to suppress the fungal infection. Fortunately, Valley Fever is not contagious from people to people, except in special circumstances such as nosocomial infections, skin infections, and infections associated with organ transplants. Valley Fever infections are reported in 22 states, although the pathogen is only considered to be endemic in the southwestern US (Arizona, California, Nevada, New Mexico and Utah), as well as parts of Mexico, Central and South America. In the San Joaquin Valley of California, Valley Fever is caused by Coccidioides immitis, while elsewhere it is caused by Coccidioides posadasii, two closely related fungi, only differentiated phylogenetically as well as by the speed of their growth under high salinity. The number of reported cases in the US increased from 2,271 in 1998 to 22,641 in 2011, and then declined again to 8,232 in 2014, with most cases reported from Arizona. Given that most infections are subclinical, infection rates are severely underreported, with an estimated 150,000 new infections occurring per year. The reason for these changes in reported number of cases is unclear, and is suggested to include changing patterns of relocations, climate change as well changes in detection and reporting. In endemic states, the overall incidence in 2011 was 42.6 cases per 100,000 people, while highly endemic areas such as the Phoenix and Tucson metropolitan areas, 15-30% of community-acquired pneumonias are caused by Valley Fever. 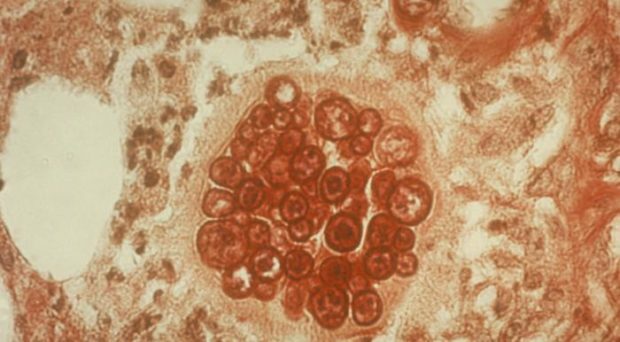 While Valley Fever is treatable when caught early, it is often misdiagnosed, and about 200 people die per year on average due to primary coccidioidomycosis. Besides infecting humans, Valley Fever also occurs in cats, dogs, horses, and camelids (e.g. alpacas,llamas) which develop similar symptoms. Between June 2010 and May 2011, 3 unrelated cases of acute coccidioidomycosis was reported in patients in eastern Washington State. The patients did not have significant travel histories to endemic areas and were confirmed to be infected by C. immitis based on a combination of culture methods, PCR and antibody detection. One patient had a wound infection from which C. immitis was isolated. All three patients resided in the Tri-Cities area, near the intersection of Benton, Franklin and Walla Walla counties, which has a semiarid climate produced by the Cascade Mountain range rainshadow, which is not dissimilar to the climate of established Coccidioides-endemic areas. Dogs and horses have also been diagnosed based on histologic findings consistent with clinical diagnosis in the area previously, although these reports were unpublished. Subsequently, soil was collected at two of the locations where the above patients were presumably infected, and 22 of 47 soil samples tested positive for C. immitis, using a newly developed “CocciDX” PCR technique. Whole genome sequencing confirmed the identity of environmental isolate genotypes with the clinical isolates from the patients. Soil samples included both those originally collected in 2010 and 2011 as well as collections done in 2014 in the same locations, some of which also tested positive, suggesting the C. immitis was persistent in these locations. This represents an apparent range expansion of this dangerous pathogen. One potential mechanism of this range expansion could have been the transport of spores of C. immitis on vehicles as fomites, which has been reported previously. Extreme weather events associated with climate change, such as droughts producing massive amount of dust, could also contribute to transport of fungal spores. However, it is also possible that C. immitis was present at this location undetected for quite some time. While the number of cases is low, this represents an ongoing risk to the public in the area, especially those that are at risk of serious complications, and those who work with soil or dust as an occupational hazard. Furthermore, the geographic extent and intensity of the colonization of C. immitis in the area is unclear and requires further investigation. The areas where it has been detected in the soil share a proximity to major rivers (such as the Yakima, Snake and Columbia Rivers), and loose, sandy loam soil type, which is where C. immitis is usually detected elsewhere. Another shared characteristics between the locations is the presence of small rodent burrows. Small rodents have been previously associated with C. immitis, and are considered a natural reservoir of the pathogen. Culturing lung tissue of rodents have been suggested as a reliable method to detect Coccidioides in an area. Locations at which C. immitis has been detected are usually categorized as either growth sites, where the fungi is actively reproducing, or accumulation sites, where fungal spores are present in large numbers, but are inactive until they can infect an animal or person. It is possible that small rodents can provide suitable conditions for a growth site, through their burrowing activity, as well as by increasing the nutrient content and humidity of the soil. Further soil testing is ongoing in Washington State by the Washington State Department of Health Zoonotic Disease Program, in collaboration with the Mycotic Branch of the CDC. In addition, there are plans to trap small mammals in order to determine the level of infection in those potential reservoir hosts. Finally, work has been ongoing to expand previously published niche models with the aim to predict the potential distribution of C. immitis in eastern Washington. With some luck with funding, the Disease Ecology Lab at the Department of Biology at Eastern Washington University, that I lead, will assist in these investigations. Even though Valley Fever was discovered in 1892, and extensively studied in the 1930s, there is still a lot that we don’t know about how to predict it’s occurrence and prevent infections. One of the most important tasks is to raise awareness, especially in areas where it has been recently recognized, such as south-central Washington, since its’ misdiagnosis can so easily become a preventable tragedy. While there are no vaccines licensed currently, there are several labs working on developing them, and ongoing clinical trials test novel treatment methods. In combination, these efforts will hopefully lead to a decreased disease burden with these bothersome fungi.